Gibbons belong to the Hylobatidae family that comprises 4 subfamilies and 17 species. 2) Eastern hoolock gibbon (Hoolock leuconedys). Gibbons live in the tropical and subtropical rain forests in several countries in South, East and South-East Asia including China, India, Bangladesh, Myanmar, Thailand, Laos, Cambodia, Vietnam, Malaysia, and Indonesia. They are highly endangered by habitat loss with the most critically endangered one being the Hainan gibbon with fewer than 20 individuals left in the wild as a consequence of their almost completely destroyed habitat. Gibbons, who are also called small apes because of their much smaller body size in comparison to the great apes, belong to the family Hylobatidae. They are our second closest relatives after the great apes and also the genetically most heterogenous ape group. They split from the last common ancestor they share with the great apes about 15-20 million years ago. Gibbons are arboreal and live high up in the trees. Compared to great apes, gibbons are more agile when travelling through the forest canopy and travel at much greater speed. Gibbons are also able to walk upright (bi-pedally) both in the trees and on the ground. Unlike the great apes, gibbons do not build nests. The gibbons’ diet largely consists of fruit but they also eat leaves, flowers, seeds, tree bark, plant shots as well as insects, spiders, bird eggs, and they sometimes also eat small birds. Unlike great apes, gibbons have not been observed using tools in the wild. 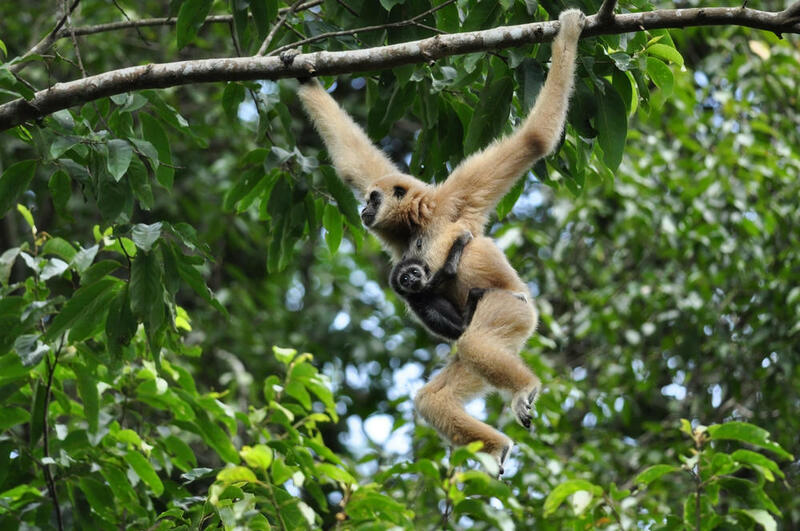 Gibbons live in serial monogamy and maintain stable bonds with the same partner for many years. A gibbon family usually consists of father, mother and their immature offspring. They are, however, only socially monogamous, meaning that they may also mate with other conspecifics than their partner if an opportunity arises. In most gibbon species, females and males do not differ much in body size but they usually differ in hair colour with the males usually being darker than females. The offspring leaves the family when sexually mature, which is around the age of 8-10 years, to find a mate and start their own family. Gibbons are extremely territorial and mark their boarders by singing their characteristic songs. The parents sing a harmonious duet in which the father’s song differs from the mother’s. Their offspring usually sings the female song before reaching sexual maturity. The siamang has the loudest and deepest vocalisations and its throat sack amplifies the sound so that it is heard up to 3 kilometers through dense forest. In the wild, gibbons live for about 30-35 years. Females and males do not differ much in size but in most species, they do differ in hair colour. Female gibbons usually give birth to their first baby at the age of around 8 years. After six months pregnancy, the female gives birth to one single offspring and it takes around 3 years until she will give birth to the next offspring. Like in other apes, fathers are usually not involved in caring for immature offspring. An exception are siamang fathers who care much more and longer for the offspring than the mother.